Taman Negara is a top destination in Malaysia that nature lovers simply won’t want to miss, the area’s premier national park. Originally called King George V National Park, Taman Negara is currently a place that hundreds of thousands of different plant and animal species call home. It is thought by nature experts to be roughly 130 million years old and currently encompasses three different Malaysian states Pahang, Terengganu, and Kelantan. 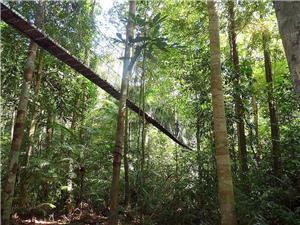 Taman Negara is noteworthy on a world scale for housing the tallest trees to be found anywhere in Southeast Asia. It is also considered to be a geologically stable location, meaning that it is a location where the evolution process has been relatively uninterrupted since the beginning of time. In addition to all of the amazing specimens of flora and fauna, Taman Negara is also home to the indigenous peoples of the Orang Asli tribe who live exactly the same way their ancient ancestors did since the dawning of civilization itself. 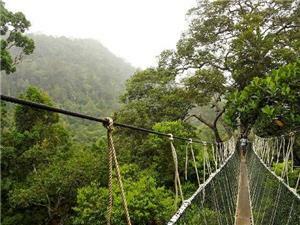 If planning a visit to the park, be sure not to miss a visit to the incredible Canopy Walkway or the Gua Telinga Caves. When you visit a untouched natural wonderland like Taman Negara, you naturally want to rely on the most convenient, exotic and environmental friendly transportation means possible. That means taking bus to Taman Negara is the obvious choice. Recommended operator NKS provides transport service from KL to Taman Negara. The first part of the journey is the bus taking about 2.5 hours to arrive at Jerantut, then transferring to a smaller bus or van to travel to Kuala Tembeling jetty for about 1.5 hours. Next is about a scenic 3-hour boat ride up the Tembeling River to the Park’s headquarters in Taman Negara (Kuala Tahan). Some more adventurous travellers will replace the first part of the journey (KL to Jerantut) by train. Then take public bus to Kuala Tembeling Jetty from Jerantut bus station which is located only less than 10 minutes walk from the railway station. For more information about Bus to Taman Negara, check out details from us today!